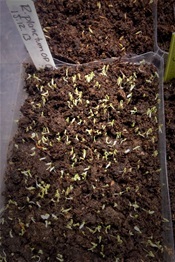 Wow, the R. planetum op seeds I mentioned in an earlier post seem to germinate like weeds. I sowed this 15th Dec. The seedlings are rather pale due to insufficient light, but I improved their lighting today.